Farmer Norman Gunsell at Mountain Ranch Organically Grown grew up raising free-range turkeys with his parents. So when he and his wife, Aimee, started their own pasture-raised chicken farm, it only made sense for them to add turkeys to the mix. But after several years of offering their heritage turkeys at the Ferry Plaza Farmers Market, they found themselves unable to compete with large farms on price. “It’s a real challenge for a small farmer because people generally only want to buy one turkey and only at Thanksgiving time, and they want it fresh,” says Norman. “It’s expensive. The growing season is twice as long as a chicken, and there’s a lot more that can go wrong.” The processing of their turkeys alone cost over $1 per pound, whereas larger farms pay less per bird due to economies of scale. The Gunsells take pride in the individual care and attention they give to each of their birds, and they pay a premium for certified organic feed and forage. Unfortunately, they found that most customers weren’t willing to pay for these high costs of production, so the Gunsells stopped offering the turkeys. This year, he’s raising about 300 guinea hens, a breed of small spotted game birds native to Africa. “They’re a really interesting bird,” says Norman. “They’re so active and verbal. They’re real characters.” Raised on organic pasture and feed, the birds have been received well at the farmers market, at a price that adequately compensates the farmers for their hard work and the costs of small-scale organic production. For traditionalists who must have their turkey this holiday season, the Ferry Plaza Farmers Market will be hosting BN Ranch, based in Bolinas. Bill and Nicolette Niman have been growing pasture-raised turkeys since 2008. (The Nimans are no longer associated with the nationally known Niman Ranch brand.) 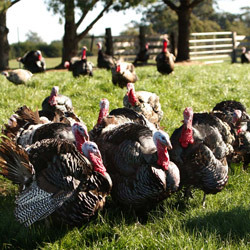 The turkeys are bred on the Nimans’ Bolinas ranch, then, after the eggs are hatched at a local hatchery, taken to their farm in Ballico, California, where they are raised by farm manager Maurisio Cuevas. The Nimans specialize in heritage birds like Standard Bronze, Narragansett, and Spanish Black, historic breeds that retain some of the characteristics of wild turkeys and have a richer flavor than modern turkeys. BN turkeys are fed vegetarian, GMO-free grain, without antibiotics. After six weeks of age, when they are old enough to fend off predators, they are given unrestricted access to outdoor pasture. BN also offers the familiar Broad-Breasted White turkeys, raised with the same humane standards. The breed makes up 99% of the turkeys raised in the United States and has been selected for its ability to put on pounds quickly. As a result, it is unable to fly or reproduce on its own. “The broad-breasted birds are 10 weeks younger but bigger than the heritages,” Bill explains. In industrial poultry operations, these modern turkeys are raised in large CAFOs, where their beaks are clipped and they are fed corn laced with antibiotics. The Nimans raised about 7,000 heritage and 7,500 broad-breasted turkeys this year, which they sell from coast to coast during the holidays. While there’s currently demand for humanely raised, antibiotic-free white turkeys, the Nimans hope that next year they’ll be able to focus exclusively on their heritage breeds, as more consumers seek out heritage turkeys for their Thanksgiving feasts. With this growing demand for heritage breeds, Bill has witnessed increasing consumer confusion in turkey terminology, with large industrial operations tossing around words like “heirloom” to market their modern broad-breasted birds. The differences are significant, since heritage birds grow much more slowly than the broad-breasted and thus require twice as much feed, making them far more costly to produce than modern birds. Mountain Ranch Organically Grown will be at the Ferry Plaza Farmers Market selling chicken and guinea fowl on November 1 and 15. 4505 Meats will also have heritage and broad-breasted turkeys from BN Ranch, as well as their famed turducken. Guinea hens photo courtesy of Mountain Ranch Organically Grown. Turkeys photo courtesy of BN Ranch.